The Ella Standard, (5-Piece) 60 in. x 33-3/4 in. 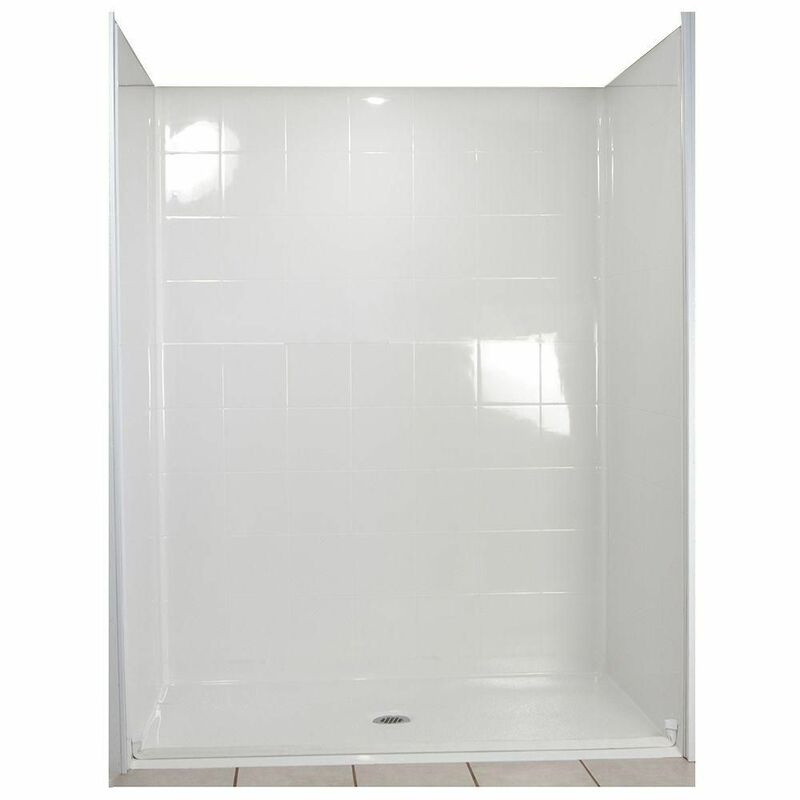 Roll in Shower is manufactured using premium marine grade gel coat fibreglass which creates a smooth, beautiful, long lasting surface with anti-slip textured shower base floor. Ella Standard Barrier Free Shower walls are reinforced with plywood and steel providing flexibility for seat and grab bar installation at needed height for any size bather. The integral self-locking aluminum Pin and Slot System allows the shower walls and the pre-leveled shower base to be conveniently installed from the front. Premium quality material, no need for drywall or extra studs for fixture support, 30 Year Limited Lifetime Warranty (on shower panels) and ease of installation make Ella Barrier Free Showers the best option in the industry for your bathtub replacement or modification needs. Made in U.S.A. For more info call 800-480-6850. Bounty Basic is the leader in the value-towels category. Unlike other one-ply paper towels, Basic cleans up and holds upwithout falling apart. We wouldn't put the Bounty name on it if it didn't .More Durable than the leading bargain Brand. Create a sophisticated bathroom space with unparalleled ease and speed. Utile by MAAX is an innovative shower wall solution that comes in a range of rich colors, deep textures and stylish patterns that look and feel like tile. Accompanied with the Halo sliding shower door and New Town tub this tub shower kit is the complete shower solution for your bathroom renovation. Standard 33-4/12 Inch x 60 Inch x 77-1/2 Inch Barrier Free Roll in Shower Wall and Base Kit in White with Center Drain The Ella Standard, (5-Piece) 60 in. x 33-3/4 in. Roll in Shower is manufactured using premium marine grade gel coat fibreglass which creates a smooth, beautiful, long lasting surface with anti-slip textured shower base floor. Ella Standard Barrier Free Shower walls are reinforced with plywood and steel providing flexibility for seat and grab bar installation at needed height for any size bather. The integral self-locking aluminum Pin and Slot System allows the shower walls and the pre-leveled shower base to be conveniently installed from the front. Premium quality material, no need for drywall or extra studs for fixture support, 30 Year Limited Lifetime Warranty (on shower panels) and ease of installation make Ella Barrier Free Showers the best option in the industry for your bathtub replacement or modification needs. Made in U.S.A. For more info call 800-480-6850.